What men lack in innate flexibility, they make up for an innate ability to drench things in sweat. Most yoga classes will provide towels. Use them. If you are a next-level sweat monster, get an extra-thick, extra-grippy mat. If even that is not enough, you can get one of those waffle-y rubberized things that the guys in the backs of restaurants stand on while doing dishes. Given that the internet now contains approximately 3 billion pictures of girls in yoga pants, we assume many guys sign up for yoga largely for the view. Which is fine, just know you're not as sneaky as you think. Don't ogle during downward dog - you will get busted. Start off with a yoga class that targets 'all levels' and let your instructor know that you're a newbie - they'll give you extra assistance. Know that experienced women in class will do most poses better than you, with the notable exception a pose called "sandhita kalaga" which roughly translated from Sanscrit means "opening the pickle jar." Did you know that some women are so concerned about their toenails that they will pay a professional to maintain them? It's true! Good money, too! And here you are cutting your toenails twice a year with a pair of scissors. Change that. Your toenails are going to be three feet (inches) from someone's eyes. Velociraptor style talons will impress no one. When you go to yoga, your gastrointestinal tract will be subjected to new and novel contortions and pressures. And two hours beforehand, you may very well eat a burrito of questionable origin and wash it down with two Michelob Ultras. Unless your toots sound like an Enya chorus or a chanted mantra, you've got some clenching in your future. If you're really not sure what to wear, we recommend a single-shoulder strap onesie in the style popularized by Andre the Giant back in the 1980's. Comfortable, practical, and with a "caveman-chic" fashion sensibiltiy. Written by Paul Simmons, Dan Abramson, and illustrated by Kevin Leung, friends of the yoga evangelists, Brogamats. This was no easy feat. My Dad is basically the entire reason I got into yoga. He's had back pain his entire life. So when I got my first back pain at age 25 - I was worried that it was going to follow me for my entire life too. I tried massages, which would just kind of feel good for a second, but then never really do anything. And then I discovered the GLORIOUS, MAGICAL, BACK-CURING power of yoga. After 1 hour of yoga stretching, my back pain disappears for about 3 weeks. Completely. 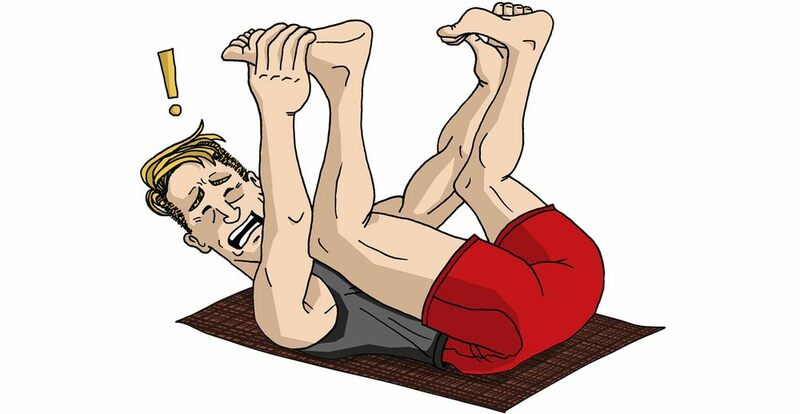 While in yoga class, I'll do a twist of some kind, and it hits the EXACT spot that my lower back chronically hurts, melting away the pain. It was a huge discovery! So I had to get my Dad to try it. He had just moved to Northern California, arguably the epicenter of the hippy/wellness movement, so I bought him a gift certificate for a private lesson with Kate Schwabacher, a trusted friend and yoga instructor that first got me into yoga. I felt klutzy and awkward, and I had a great deal of discomfort with even the basic routines. I learned a lot, especially flexibility and balance exercises similar to those I had seen in Physical Therapy. Kate helped me learn to get down on the floor and get up with ease I hadn’t felt in years. If I had kept it up for a few more lessons, I might be in a regular class now. Dad's first chair pose. With special help, catered to my Dad's injuries, from Kate Schwabacher. Lesson learned: it takes a couple of sessions to feel the benefits of yoga. It is the ancient solution to the modern ailment of chronic back pain, but it doesn't necessarily work right off the bat. Trying yoga is like trying weed, you might not feel it the first time. So my Dad tried his first yoga class, and now I'm hoping there will be a second one. After seeing my him struggle, it reminded me that I also stumbled around for my first few yoga classes, feeling "klutzy and awkward." The only reason I kept doing yoga, is because it was offered for free at work. My Dad, despite his backpain, is incredibly active. He's an avid Cyclist, who's peddled his way through the soul crushing hills of Connecticut as well as endless nightmarish inclines of Provence, France. He's done numerous "Centuries" (which means riding over 100 miles). And I don't think I've ever broken 50 miles. Even now into his 70s, he still rides his bicycle every day. But my guess is he didn't fall in love with bicycles the first time he tried one either. So I remain fastidious in my mission to get him to do yoga a few more times, until the good stuff starts happening. Do yourself a favor and get yourself a FRAN. Someone who pushes you to experiment with cool materials and cool printing machines in a garage somewhere. Fran was integral in getting Brogamats prototyped and figured out. She runs a print shop called Ella Print in Bernal Heights, http://bit.ly/1hstWxm and can print on wood, plastics, BATTERIES, and all kinds of fabrics you’d never think of. And now we’re making broga bags! Here’s the first round of the burrito held by the lovely Audrey from Ella Print.